Happy Wednesday, friends! I'm excited to share two things with you today. One is this Zara top I found on the clearance rack when I went to return something. I rarely wear Zara because their clothes rarely fit me. I remember seeing this top somewhere online (pinterest or maybe another blogger, I cannot remember) and really liking the gold studded detail so I was excited to find it in the store, on the clearance rack, and the single size left fit me! The second thing I'm excited to share is this vintage clutch! Perhaps you remember my outing to Scott Antique Market back in September and the lady, Hilary Eiseman, with the awesome vintage bags. I had mentioned how I really liked one of them but it was out of my price range (it was in the last picture of the linked post). My mom surprised me with that exact clutch for Christmas! It was apparently made in France by a jeweler. It's a reptile leather (I believe) with a leather lining, but has no interior labels or markings. I would love more information about the clutch - it's very unique and pretty. Thank you so much for stopping by today. Stay tuned - I have a giveaway planned for Friday! You look soo pretty <3 Love your blouse! That top is so delicate and beautiful- I love the low back. And can I just drool over that clutch?! Perfect finishing piece! Not sure whether the blouse or clutch are more fantastic! Those little stud/jewel touches make them both so glamorous and unique. Love the top! I have the same issue with Zara sizing! The clutch is gorgeous and so unique! That blouse of gorgeous, Mary Ann! Even better that you scored it on sale. And the clutch is amazing too, what a thoughtful gift! This shirt is so pretty! You look gorgeous. I LOVE that clutch. It's gorgeous, and the fact that it's vintage makes it even better. very pretty top mary ann and i love that clutch. the turquoise details on it are so pretty. Such a cute look! 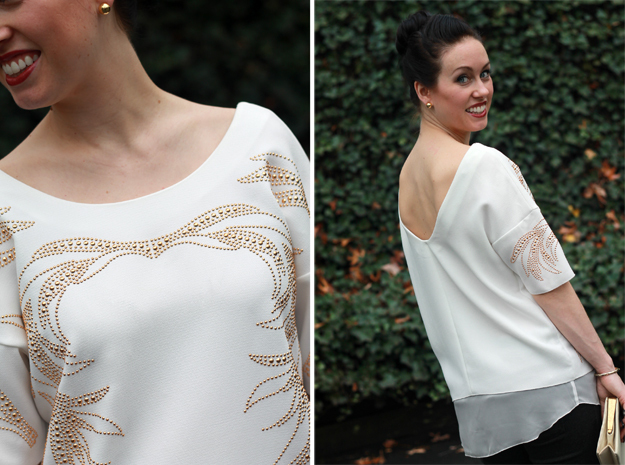 Loving the detail in your blouse! In love with your clutch! I'm sure it was an amazing surprise!! That top is so beautiful Mary Ann! love the gold details on white! I'm obsessed with your clutch! This outfit is gorgeous, and your clutch and ring are just to die for! What a sweet, stylish, and thoughtful gift from your mama. I love the top and the clutch is beautiful! Great finds! You always have the greatest pieces! I would never even think to look at either of those (because I'm so boring) but they are truly beautiful items. Love the top...great score from Zara and that bag...AMAZING!! I love vintage items and this one is definitely a one of a kind.